For many years we have enjoyed good worm control in our flocks – but this has become increasingly reliant on effective anthelmintics (wormers). Unfortunately this heavy reliance has also sped up the development of anthelmintic resistance. Drenching ewes and lambs to a set pattern during the year, as we all did historically, often results in the overuse of wormers and a lack of treatment according to need and targeting for specific parasites. If we want to preserve the activity of anthelmintics for the future, we have to look to use them only when necessary and improve how we use them. How does anthelmintic resistance develop? Every time we use an anthelmintic, worms that are susceptible to its chemical activity are killed and, if present, any that are resistant survive. Over time the continued use of that chemical will result in an increasing proportion of resistant worms and eventually this will be high enough so that wormy sheep do not respond to treatment. This process can be slowed or speeded up by certain management practices. Click here to understand more about what anthelmintic resistance is. For the majority of farms it is not too late to take action to slow the progress of anthelmintic resistance. Although we can find worms that are resistant to the 1-BZ (white) and levamisole (2-LV yellow) wormers on the majority of farms, it may not have reached a level that causes an obvious problem on all of them. For the macrocyclic-lactone (clear 3-ML) wormers there has been a marked increase in recent years, probably linked to their widespread use as endectocides for the treatment of sheep scab. Action to try to preserve this group is now imperative. Basic good practice is using anthelmintics properly and effectively to get the best from each treatment, preventing the importation of problems to your farm, and choosing the right product. It is also vital to reduce selection pressure by avoiding the over-use of anthelmintics, implementing other practices to help reduce the challenge form worms, and limiting actions that select heavily for resistance, such as drenching directly on to a clean pasture. Implement quarantine treatments. Not all farms have resistant worms so quarantine treatments are vital to ensure that any in-coming sheep don’t bring resistance with them. Find out more here. Administer drenches correctly and at the right dose rate. Always dose to the heaviest in the group and check the dosing gun is working properly by discharging it several times into a syringe or measuring jug. Make sure the drench goes over the back of the tongue and, where possible, restrict access to feed before administering 1-BZ (white) or 3-ML (clear) drenches (but never for pregnant ewes). Find out more here. Test for resistance. Find out which drenches are working effectively on your farm by taking dung samples before treatment and again a set number of days afterwards. Use this information to plan a strategy that takes account of your current resistance status with the aim of maintaining the effectiveness of the chemical groups that are still working. Find out more here. Look at your control strategy. Are you drenching to a set pattern every year? If so, it’s time to sit down and look at the reasoning behind each treatment and whether there is scope to reduce the number of treatments or to target them better. Consult your vet or adviser and look at how you can implement these recommendations. Some strategies can be put into practice quickly, while others will take time – but the sooner you act the longer the drenches will work for you. Reduce dependence on anthelmintics where possible. Looking for ways to use other strategies, such as grazing management to reduce worm burdens, remains an important part of worm control. Find out more here. Try to use anthelmintics only when necessary. Faecal egg count (FEC) monitoring has an important part to play in determining when and which sheep to drench. Sheep farmers who regularly use FECs use less drench overall and therefore reduce the selection pressure for resistant worms. Minimising the treatments given to mature sheep that are immune to most worm species is also important. If adult sheep are fit and healthy, the need to treat them is limited and some routine treatments such as ewes pre-tupping avoided for the majority of the flock. Find out more here. Select the most appropriate anthelmintic. Monitoring can also be used to show which parasites are present and this helps to reduce the use of broad spectrum anthelmintics. For example, liver fluke can be treated with flukicide products that do not contain any of the wormer groups, and Haemonchus contortus (Barber’s Pole worm) can be treated with a narrow spectrum wormer. This can significantly reduce the unnecessary use of the anthelmintics we need to preserve, particularly in adult sheep. It is also usually cheaper! Find out more here. Preserve susceptible worms. What we need to try to do is to avoid exposing more worms then is necessary to the anthelmintic. This is quite easy when sheep are on heavily contaminated pasture because there is a large proportion of the worm population on the pasture and these escape exposure. At other times, there is a risk that only a small part of the worm population is outside the sheep treated, and this is highly selective for resistance. The most extreme example of this is when lambs are treated and moved straight on to a new ley, which has no worm population on it. The only worms that survive and go with the lambs will be resistant and the new ley will have a fully resistant worm population. 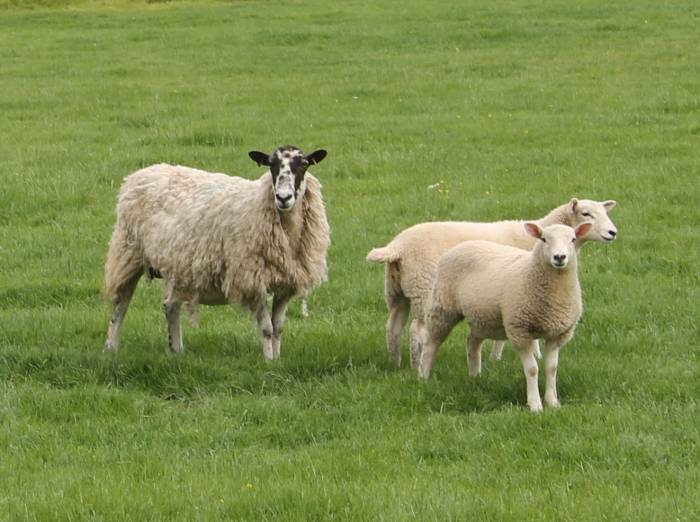 There are two ways to mitigate this risk and make sure both resistant and susceptible worms go with sheep while still capitalising on the clean pasture. Either treat them a few days before moving (leaving them on the old pasture during that time), or leave a small number (10%) of the sheep untreated. It is never to late to make a start.